Baton Rouge is the home of one of the oldest and longest running Field Target matches in the US. 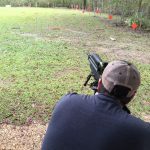 For roughly the last 25 years, the Cajun Spring Classic has been a must-attend event on many shooters lists. 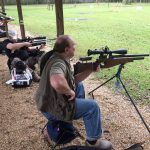 The good folks at the Bayou Airgun Club combined their efforts with Pyramyd Air to offer some exciting, head-to-head air gun action in the form of the Pyramyd Gunslynger. The Gunslynger is a fast paced, speed silhouette competition where competitors are paired up in a March Madness style draw (how ironic that the event took place in March). Each shooter must knock over 16 metallic 1/10th scale silhouettes, and whoever finishes first advances to the next round in the draw. Up for grabs were Pyramyd Air gift cards for first, second and third place. The event is not only fun for the shooters, but the spectators as well. Due to the initial success of the Gunslynger at the Pyramyd Cup, we decided to make the game accessible to everyone and take it on the road. We will be offering the Gunslynger at a few field target matches across the nation in 2016 and are looking for more venues and hosts for the remainder of the year and beyond! The flooding and storms leading up to the event on Saturday morning definitely threw a monkey wrench into our plans, but match director Paul Plauche did an excellent job of keeping things moving. Thanks to help from many of the shooters on Saturday morning, we were able to quickly set the silhouettes up on blocks and get the event running. The draws had to be trimmed down as there were many no-shows due to the impending weather. 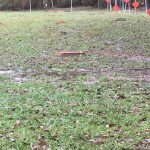 Thankfully, the Bayou Airgun Club has a first class facility and covered range for us to use. We ran two draws, one PCP and one Springer. This is the same format used at the Pyramyd Air Cup, but with a twist. Instead of the traditional benched style shooting, we ran this as an FT style Gunslynger. This meant that competitors had to shoot from an AAFTA approved position for their matches. Hunter class shooters can use either shooting sticks or a non-attached bipod and sit on a bucket or other type of back-less stool. Rifles can shoot up to 20 FPE. Scopes are limited to 12x magnification. Open class shooters are allowed to use straps and shooting jackets. There is no magnification limit for scopes and the guns can shoot up to 20 FPE. Shooters are also allowed the use of thigh rests on their guns. WFTF shooters are not allowed to use straps or thigh rests, but can use shooting jackets. There is no magnification limit for the scopes but the rifles are limited to 12 FPE or less. Unlike an FT match though, the shooters were not just shooting against those in the same class, but against all competitors shooting that style of power plant. It was a true test of both speed and accuracy from your chosen position. The distances for the targets are 10 yards for the chickens, 25 yards for the pigs, 40 yards for turkeys and 50 yards for rams. Normally the rams would be at 55 yards, but the range at the club still had a lot of resting water from the flooding that kept us from being able to get those extra five yards. Andy Burns (R) shooting his Rapid Air Weapons TM1000, hunter style against Mike Koratich (L) shooting a Walther LG300 open class style. With dark cloud cover and intermittent rains coming down, we got the match started. Our first match-up of the day was in the springer division. We originally had five spring gun shooters in the draw, but due to a few of them needing to help revamp the FT course due to rain, that left us with two. Thankfully, Matt Sawyer brought along his trusty Diana RWS 54, as he was able to fill in and make it a round robin draw. All three competitors would shoot against each other, the competitor with the most wins would be crowned the champion and be awarded a $200 Pyramyd Air gift card. Considering there were only three competitors, all three would be getting gift cards as the prizes for second and third were $100 and $50 respectively. Randy Smith and Jeff Cloud got us started. Randy shot WFTF style with a 12 FPE Walther LGU, and Jeff shot hunter style from shooting sticks with an HW97K in a gorgeous blue laminate stock. They started the competition off in excellent fashion, with their match-up coming down to the last target. Randy was able to sneak by Jeff by taking down the last ram just as Jeff was loading for his final target. It was a real nail biter and certainly got the attention of the rest of the shooters. Close finishes are part of the reason the Gunslynger is so much fun and a real spectator event. Jeff was then paired up with Matt Sawyer. Matt shot WFTF style with his RWS 54 and was a real speed demon. I was wondering how he would fair with the side-lever action versus the under levers, but he impressed me and breezed right through. With one win each, he and Randy would face off to see who would take home the $200 Gift Card prize. Both Matt and Randy were tight on the first banks of targets, but as they moved to the Turkeys, it was clear that Matt gained the upper hand. He cruised to victory winning by 3-4 targets. Not bad for just pulling the gun out of the car! I know he was happy he had it and I'm sure he will spend his newly earned gift card well. On the PCP side. things progressed very quickly and we saw a few hotly contested match ups. Bill Rabbitt, Harold Rushton and Jeff Paddock all made relatively quick work of their early round opponents, and rightfully so as they all have experience in the Gunslynger from the Pyramyd Air Cup over the last two years. Travel companions Chris Corey and Paul Porch had a good first round match as well. Paul took an early and commanding lead only to see Chris storm back as Paul struggled with the 50 yard rams. Despite being down by four targets, Chris stayed positive and zoned in. Paul missed three shots in a row on the long rams and Chris took advantage of the opening. Well done Chris! He then defeated Ron Brown (another PA Cup veteran) in a tense quarterfinal showdown. Ron was using his Air Arms FTP 900 and was shooting very well but was at a slight disadvantage shooting 12 FPE against Chris' 20 FPE Steyr. The wind definitely took a toll on Ron in that round. Chris matched up with Bill Rabbitt in the semi-finals, and Jeff took on Harold on the other side of the draw. Bill was able to make relatively quick work of Chris to move into the finals. Harold and Jeff had a slightly closer match but Harold still won by a three target margin. The final and third place matches were set, and the shooters took their positions. Right from the start, you could see that these guys meant business! Harold and Bill both began at a blistering pace, it wasn't until they reached the 40 yard turkey’s that we saw one gain an advantage. Those turkey’s are by far the hardest of the animal silhouettes to shoot, but Bill did well to get through them while the wind blew. Harold was not so lucky and missed a couple that created all the separation needed for Bill to close him out. It was a similar situation for Jeff and Chris. Jeff missed a few early that gave Chris all the room he needed, and Chris closed it out to claim third place. Overall, the competitors had fun shooting the Gunslynger, which is what it is all about! It's a different kind of experience than most airgun competitions in that you need speed and precision to win. It gets shooters out of their comfort zones and gives them an opportunity to directly test their skills against other shooters. There really isn't anything else like it, and that's why it's so much fun! To all of the shooters that braved the rain and wind to come shoot it, my deepest gratitude and thanks! We are looking forward to bringing the Slynger to different parts of the country this summer. We will be joining Crosman for its All-American Field Target Championship, July 8-10 in Rush, NY as well as where it all started, The Pyramyd Air Cup, September 9-11 in New Philadelphia, Ohio. We hope to see you there! You can see the faint orange as you look down range, those are the tiny 1/10th silhouettes!